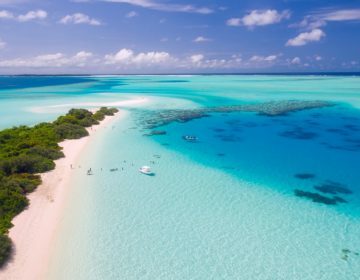 Surrounded by the cerulean waters of the South Ari Atoll, Centara Grand Island Resort & Spa exudes a timeless and enchanting appeal for those looking for the ultimate barefoot paradise. 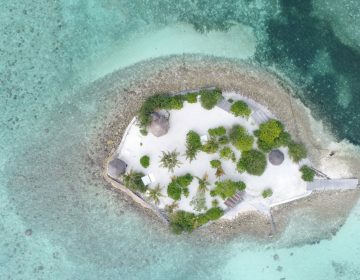 Boasting colonial-style buildings connected by timbered walkways, spacious over-water villas and suites that seamlessly blend into the natural surroundings, and a palm-fringed beach and shimmering lagoon, this luxurious retreat promises an idyllic getaway. 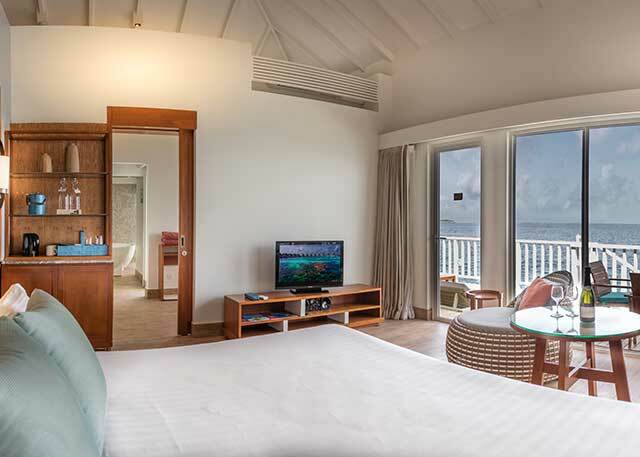 Accessed by a private seaplane flight or a transfer between Velana International Airport and Maamigili Airport and then onto the island, the resort offers exquisitely appointed suites and villas with airy indoor and outdoor living spaces, and deluxe amenities. Guests can also unwind at the exclusive spa and wellness center, a fitness and yoga center, and several restaurants serving a wide variety of delectable Asian and Western-inspired cuisine. 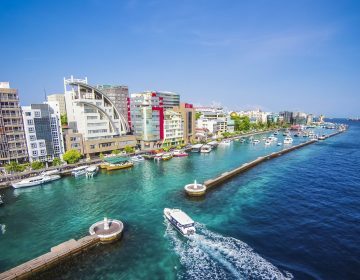 Water-sports abound at Centara Grand Island Resort & Spa Maldives and guests can enjoy a range of outdoor and recreational fun, including swimming, snorkeling, scuba-diving, windsurfing, wake boarding, water skiing, banana-boat riding, and more. 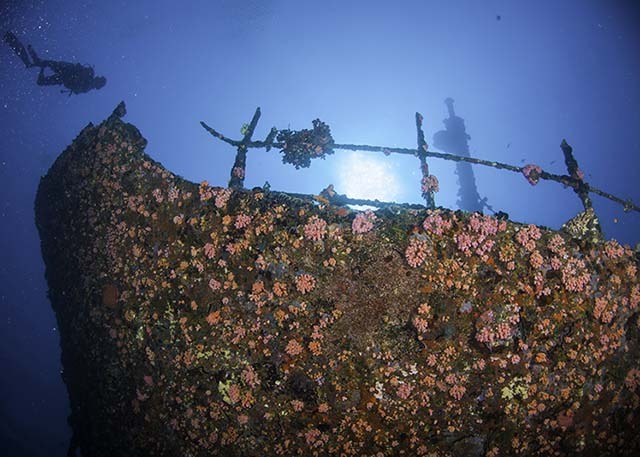 The island has a shipwreck just off shore which makes for excellent diving, along with easy access to some of the most famous dive sites in the world. 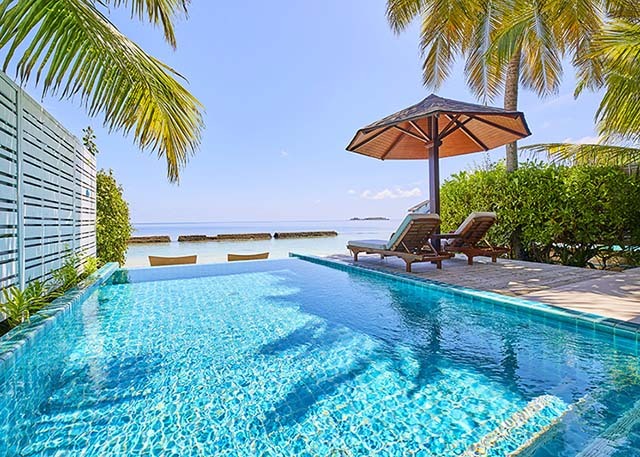 Accommodation at the Centara Grand Island Resort & Spa consists of beautifully appointed Crusoe-esque clapboard villas with thatched roofs set connected by timber walkways and overlooking white sandy beaches and the shimmering azure waters of the lagoon. Villas are spacious and airy with stylishly decorated interiors of white and natural hues enhanced by splashes of color, and gorgeous outdoor decks with spectacular views. The appropriately named Beach Suites are set right on the beach with beautiful views of the lagoon. These luxurious suites offer elegant island living with spacious interiors with designer décor, king bedrooms on mezzanine levels, and en-suite bathrooms with outdoor showers. Deluxe in-villa facilities include flat-screen televisions with international satellite channels and in-room movies, DVD players, IDD telephone lines, individual climate control with cooling and heating, ceiling fans, minibars stocked with free items, coffee machines with coffee and tea, hairdryers, in-room safes, and complimentary high-speed Internet. 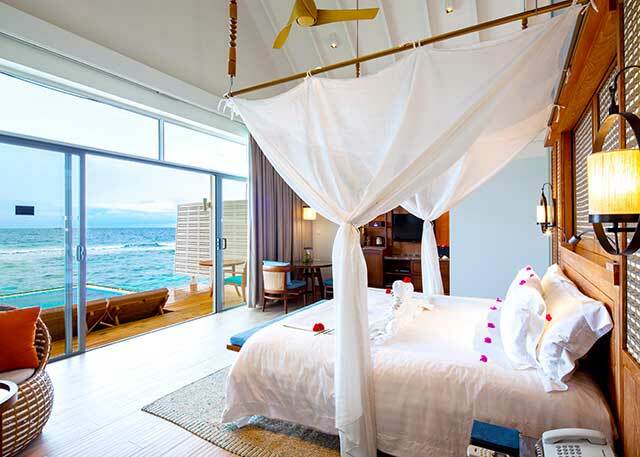 Decorated in soothing tones of creams, whites and natural beiges with rattan and hardwood furnishings, Deluxe Water Villas epitomize laid-back island living. Ample living rooms open onto sundecks with breathtaking views of the lagoon, king bedrooms have en-suite bathrooms with walk-in rain showers and soaking tubs, and stunning ocean views. 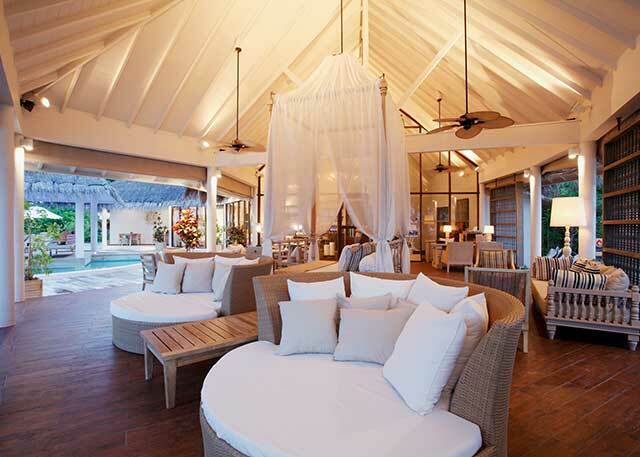 Set on the northern side of the island, these villas can accommodate up to three adults and one child. 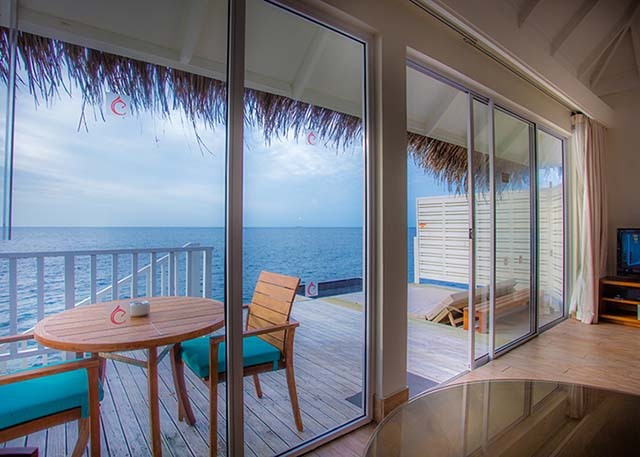 Designed to accommodate families with young children, these over-water villas offer 300 square feet of family space, including a children’s sleeping area with bunk beds and PlayStation video games, and secured access to the expansive terrace for the safety of the little ones. Set on the southern side of the island, the abodes have king bedrooms with en-suite bathrooms boasting Jacuzzis or free-standing bathtubs, and spectacular unobstructed ocean views. Situated on the western end of the island, these newly refurbished villas are designed for lagoon living with vast terraces for lounging and basking in the sun, sea-gazing king bedrooms with en-suite bathrooms and direct access to the water, over 400 square feet of living space with rattan and hardwood furnishings. 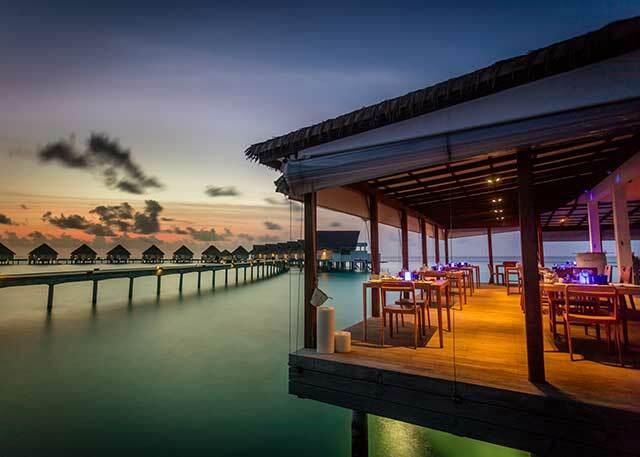 Dine in style and privacy on the expansive terrace overlooking the lagoon as chefs prepare your meal. Luxury Beachfront One-Bedroom Pool Villas are fringed by white sandy beaches and crystal clear waters and feature over 500 square feet of living spaces, private plunge pools and expansive sun terraces with awe-inspiring views. These immaculate villas are decorated in island-inspired hues of whites, creams, beiges, and blues, and boast king bedrooms designed for couples with en-suite bathrooms with indoor and outdoor showers, and soaking tubs. Spacious and light with ample space for families traveling with up to three children, Luxury Beachfront Two-Bedroom Pool Villas are a stone’s throw away from the shimmering lagoon and feature a vast sun terrace with private plunge pool and sun loungers and their own beachfront areas. 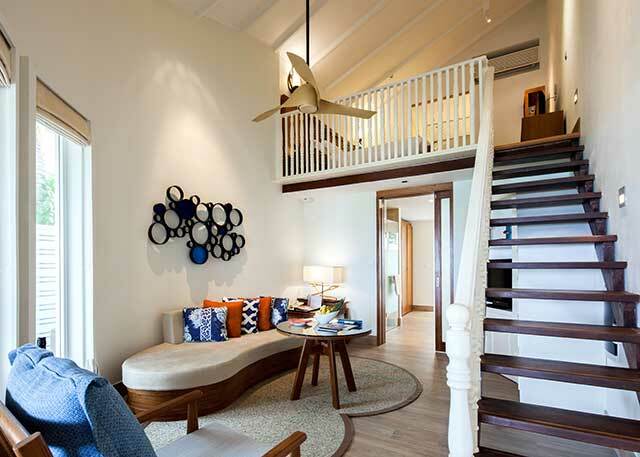 Villas have elegant 500-square-foot living spaces that are beautifully furnished with designer décor in rattan and hardwood and two bedrooms, one of which is located on the mezzanine floor and the second smaller with twin beds on the ground floor. These idyllic villa hideaways are situated on the western end side of the island and feature sea-gazing bedrooms with en-suite bathrooms, ample living areas of up to 600 square feet in size with designer furnishings, and vast terraces with private plunge pools and sun loungers for sunbathing and soaking up the sublime sunset views. Expect award-winning cuisine, handcrafted cocktails, signature spirits, and fine wines from around the world served in spectacular settings at the Centara Grand Island Resort & Spa. Savor sumptuous champagne breakfasts at Reef Restaurant, dine in style over light lunches and sublime dinners at Azzuri Mare Italian Restaurant, Suan Bua Thai restaurant or Reef Restaurant, and sip colorful cocktails at Aqua Bar or the Coral Bar and Lounge. 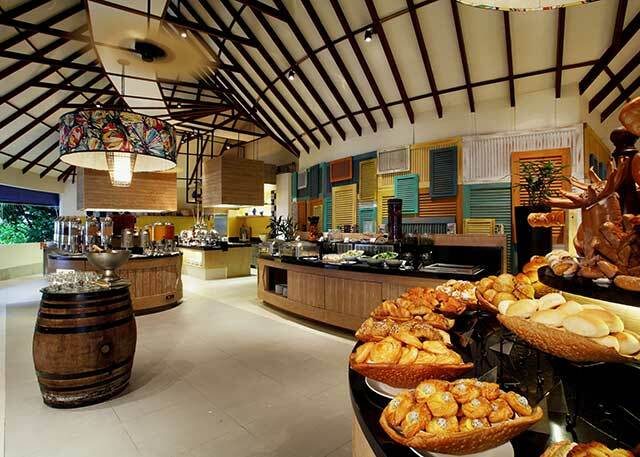 Set next to the swimming pool with beautiful beach views, the thatch-roofed Reef Restaurant is a classic island eatery where champagne breakfasts, light lunches, and delicious Asian and Western-inspired dinners can be enjoyed. Tuck into authentic Italian fare at this romantic Mediterranean restaurant that boasts dreamy views across the lagoon. The elegant spot serves signature Italian dishes such as mouthwatering pasta, pizza and meat entrées, fresh seafood and catch-of-the-day, and decadent desserts, along with fine Italian wines and spirits. 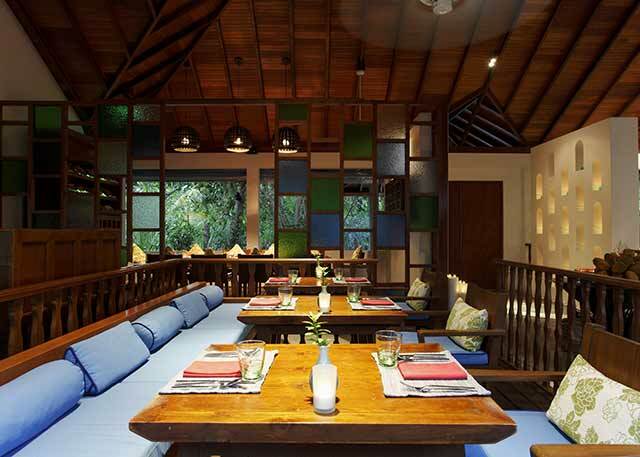 Situated next to a tranquil lotus pond with indoor and al fresco seating, Suan Bua serves authentic home-style Thai cuisine that is packed with the tangy, spicy accents and flavors from the four regions of Thailand. The menu boasts famous dishes such as Pad Thai, Som Tam and Tom Yum Kung, fresh fish and shellfish, along with creative vegetarian dishes. Set over the water on the western side of the island, Aqua is one of the island’s best spots to soak up the spectacular ocean views and sunsets. 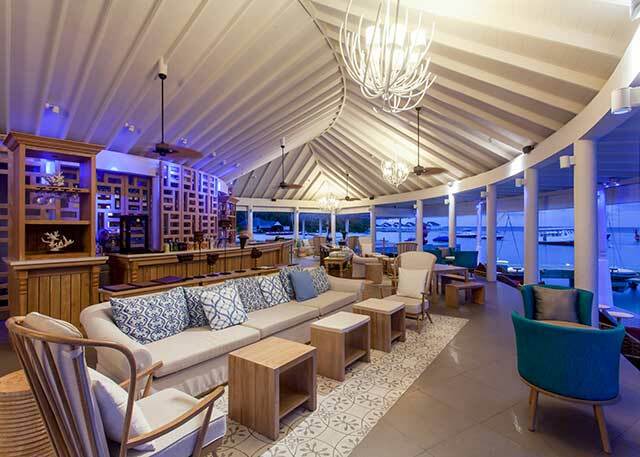 Perfect for pre-dinner cocktails or a nightcap, stunning bar and lounge also host daily sun downer parties. 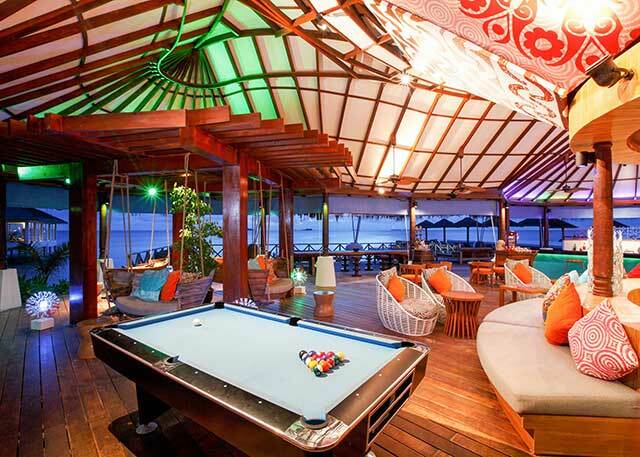 Spanning two stories with a casual sand-floor setting on the ground floor and a pool tables and games on the mezzanine level, the Coral Bar & Lounge is an elegant lounge and bar next to the swimming pool. Enjoy complimentary afternoon tea, fine wines and handcrafted cocktails, as well as daily afternoon ice creams. Designed as an exclusive and intimate retreat for Club guests, The Club is a private lounge and restaurant area for all-inclusive guests or guests staying in one of the Sunset Ocean Pool Villas. The Club serves á la carte breakfasts, light lunches, and mouthwatering five-course dinners with the option of a romantic, candlelit setting. Complimentary premium spirits and wines are served throughout the day, along with refreshments and tea and coffee. Indulge in pampering massages and body treatments at the Spa Cenvaree, a luxurious oceanfront sanctuary for the senses. 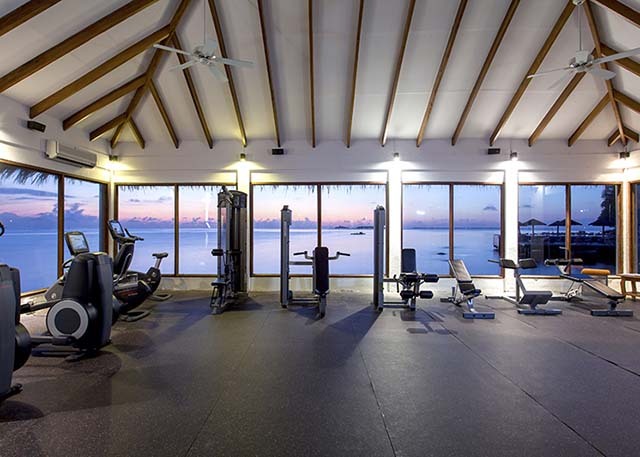 The spa features an outdoor overwater venue dedicated to Thai massage, deluxe suites for singles and couples, facilities for Vichy hydrotherapy and hot and cold plunge pools, and scheduled yoga sessions on the beach or in the fitness center. Centara Grand Island Resort & Spa offers an array of leisure and recreational facilities, ranging from beach and water sports, indoor activities, yoga and fitness instruction, guided excursions, and children’s activities. The Centara Grand Island Resort house reef and lagoon provide excellent snorkeling, and just off the reef, there is a dedicated shipwreck that offers fantastic scuba-diving opportunities and close encounters with manta rays, anemone fish, lion fish, parrot fish, turtles and whale sharks. 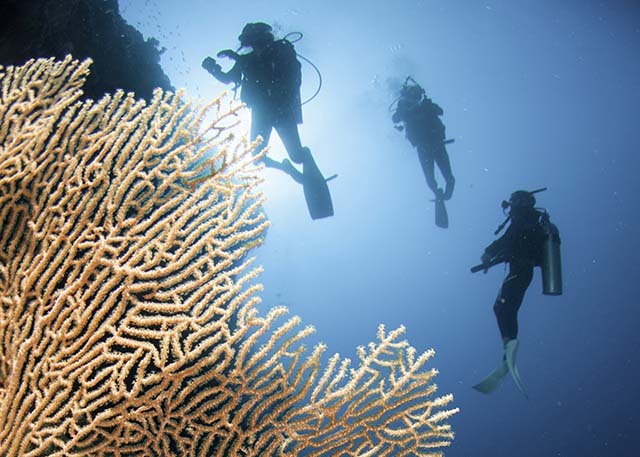 The resort has a dedicated PADI Dive Center where guests can take courses, lessons and guided snorkeling and scuba-diving trips on the house reef, the house wreck, and the surrounding islands. A wealth of water sports are also offered from pedal boating and paddle-boarding to canoeing, kayaking, sailing, snorkeling, windsurfing, and sailing. 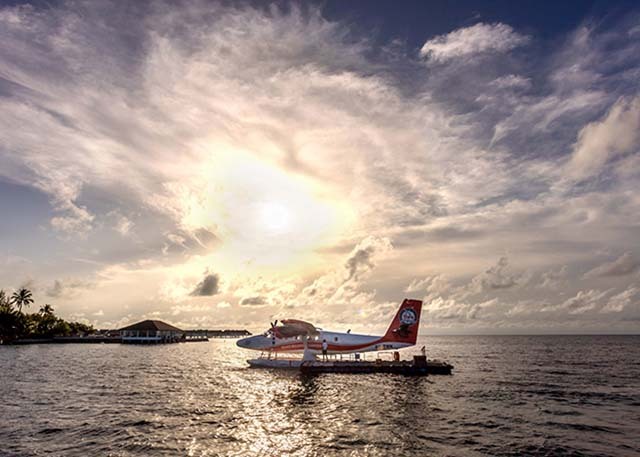 Motorized water sports such as jet skiing, wake boarding, and parasailing are also offered, and guests can enjoy daily half-day and full-day excursions, including snorkeling tours, traditional dhoni sunset cruises, local island discovery tours, and sunset fishing. Family activities include a family itinerary that includes visits to Camp Safari and E-Zone for the youngsters, and banana boat and tube rides, water sports, beach games and activities at the pool for older children. 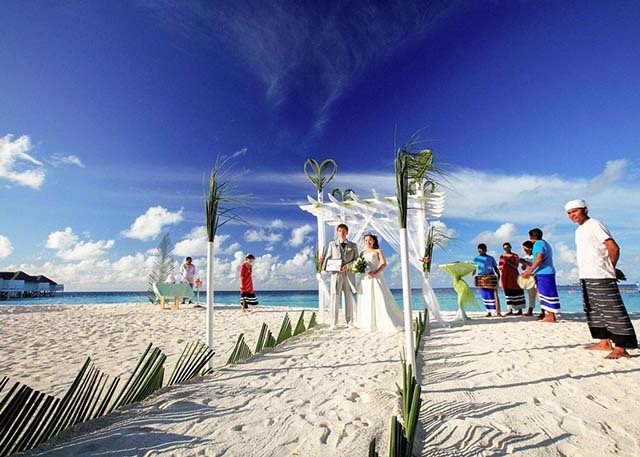 Centara Grand Island Resort & Spa offers stunning venues for once-in-a-lifetime weddings and honeymoons. Designed for an all-inclusive experience of a lifetime, the resort offers a selection of traditional Maldivian marriage or renewal of vows packages, including the Moodhufini Wedding Package and the Underwater Wedding Package. Centara Grand Island Resort & Spa offers a Camp Safari and E-Zone for young children, and a range of exciting activities like beach games and events at the pool, banana boat, and tube rides, and water sports, for teenagers. Take the plunge and book this once-in-a-lifetime retreat here.